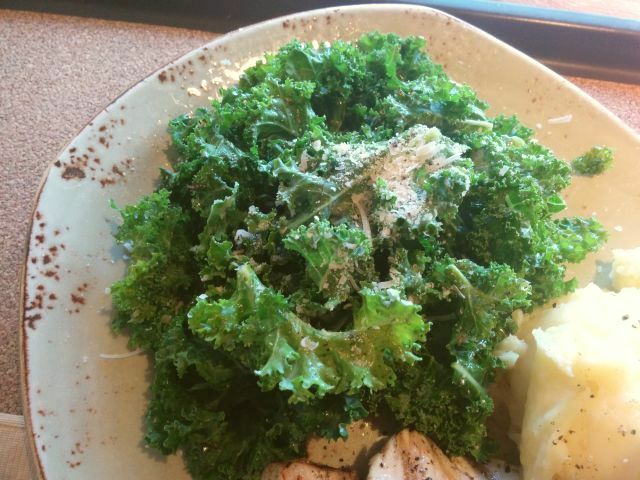 Tender Greens' Big Plates come with a choice of six different proteins, one of six simple salads, and a side of Yukon Gold mashed potatoes, starting at $11.50. You can also get it as a sandwich with a simple salad, or as a full-sized salad with a garlic herb crostini. 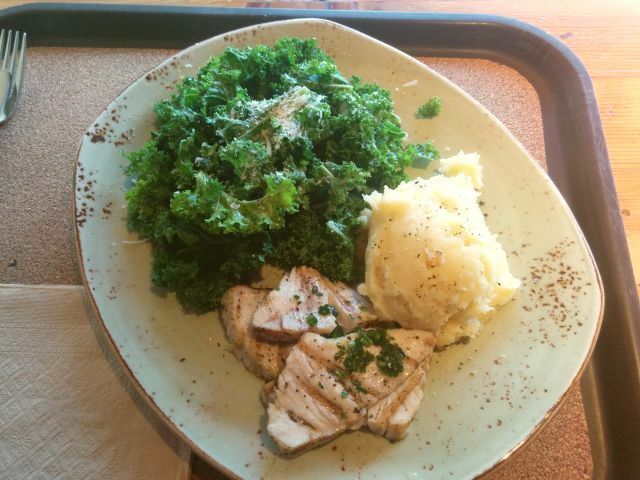 I went with the Herb Brushed Albacore Big Plate and choose the Kale Simple Salad to go with my mashed potatoes. The albacore has a 50-cent upcharge, so my meal cost $12. Like Urban Plates, Tender Greens is one of the cafeteria-style fine/fast casual chains that have become popular as of late that feature a focus on "farm-to-fork" dining. 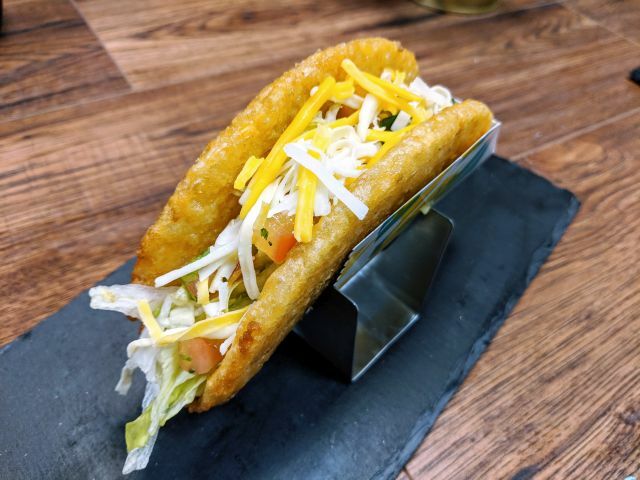 Tender Greens is primarily based in California with 24 locations from San Diego all the way up to the San Francisco Bay area, although most are located in Los Angeles where it originally started. 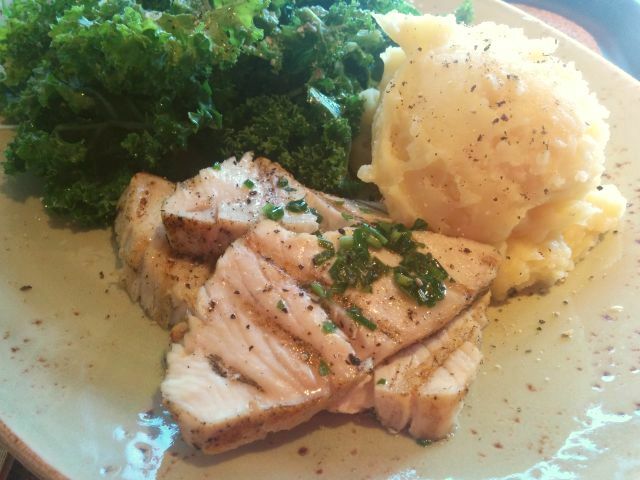 The Herb Brushed Albacore comes seared rare as default. I was recovering from an illness when I went to eat, however, so I asked for my fish to be cooked medium rare just so it'd be a bit easier to digest. Unfortunately, as I made my way down the line, I saw the worker slice my albacore before tossing it onto the flat-top, ensuring that the majority of the pieces were mostly well-done (with perhaps two pieces medium-well). Due to the nature of the cafeteria-style service, by the time I was seated with my food, my fish was already lukewarm at best. Aside from the doneness of the fish, the seasoning was just alright for me. The lemon herb dressing that was brushed on showed a few bits of chives, but was fairly low on the herby notes as well as on the salt. My strongest impression of the dressing was that it was way too oily. The taste of the actual fish, however, was very pleasant; good quality albacore with no strong fishy smell or aftertaste, and despite being overcooked, had a pleasantly soft yet meaty texture. The Kale Simple Salad was supposed to come with a roasted garlic vinaigrette, but I think I received the wrong dressing. The vinaigrette I received had a heavy lemon flavor and no garlic notes that I could discern (and that was not for my lack of trying). It came topped with parmesan, although I do wish there was a little more. The baby kale was of excellent quality: very fresh, firm, and brightly colored with nary a brown spot in sight. The Yukon Gold mashed potatoes came in a generous serving and, temperature-wise, was the only hot thing on my "hot plate" complete with a bit of steam. These were some seriously hearty mashed potatoes: thick, rich, and very buttery. The potatoes were probably the most seasoned item on my plate, probably due to all of that delicious butter. Overall, the Herb Brushed Albacore Big Plate at Tender Greens was still a nice plate of food. The actual food itself was of good quality even if I didn't favor the seasoning as much, and the salad greens in particular were of excellent quality. I probably would have enjoyed the meal much more had they not messed up 2/3 of my plate. If I were to eat here again, I think I would opt for one of their Big Salads instead, which clocks in at the same price as a Big Plate, because I think the lukewarm temperature of the protein served would become a non-issue on a salad.